Previous research has identified three distinct forms of linguistic ambiguity: lexical, surface structural, and deep structural. Cummins and Das (1978) studied these forms of ambiguity in the context of Das, Kirby and Jarman's (1979) model of simultaneous and successive processing, and demonstrated that comprehension of lexical ambiguity depended upon simultaneous processing, while that of surface and deep structural ambiguity depended upon successive processing. The present study investigated the relationship between these cognitive and linguistic processes in a group of older children. The subjects' level of English achievement was also considered. The results showed that comprehension of all three forms of ambiguity was strongly related to level of English achievement, though deep structure ambiguities best descriminated the English achievement groups. Results also showed that perception of all types of ambiguity was related to both simultaneous and successive processing. Subjects with high successive processing scores had an additional advantage in perceiving deep structure ambiguities. 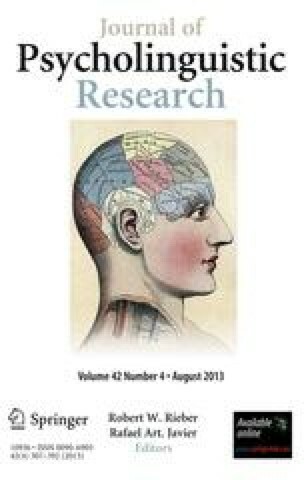 These results suggest the need for an elaboration of the Cummins and Das cognitive process model of liguistic processes, demonstrating that a variety of task variables can alter the cognitive processes required in performance of linguistic tasks. This study was supported by an Australian Research Grants Committee grant to J. B. Biggs and the author.